Recently Chicagoland has been in the high 70's to 80s. That is just madness. We went straight from winter to Summer! 2- Welp, there go the brassicas!! 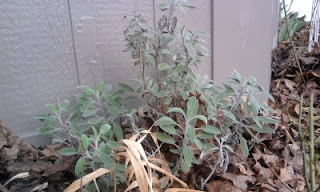 3- I should focus on more heat tolerant plants. Although who am I kidding? With this hot weather, it's probably going to fast forward to bolt. With that in mind, I have Indian Malabar spinach in a seedling tray. The Indian climbing spinach loves the heat, and will be great to take over for the rest of the season. but I am glad to see the mild winter had it coming back on its own! Our lovely Sage! I took a gamble and left it outside by the front door. I read online they are zone6, but hoped the proximity of the home would shelter it somewhat and HUZZAAAAAH it worked! 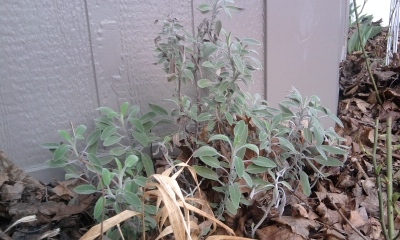 In fact the brown leaves on the plant were the only ones affected by frost! The blanket of leaves might have helped, too. 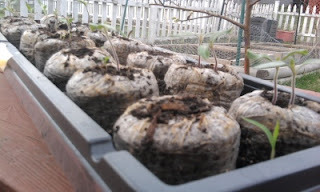 I will try to overwinter a fig outdoors next winter. 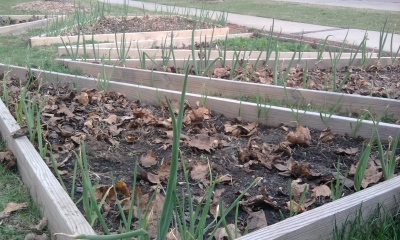 I have been dreaming of doing such, but we were zone 5A. Recent news said we are now 5B. MU HU HUHA HAA ::Evil cackle:: It's all coming to plan nicely. Rainbow Heirloom Tomato seedlings, and Korean Giant asian pear in the background. 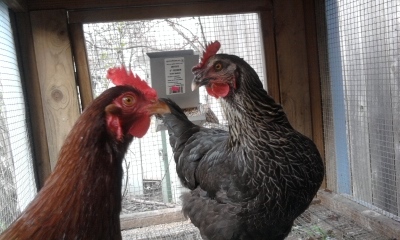 The ladies would like you to know they have overwintered just fine, too. Two eggs each day, give or take one every so often due to lack of daylight. We had a few predators stop by, but nothing the locks didn't keep out. The bottom of the coop is also double layered wire, and the previous owner made it raccoon proof. The #1 thing backyard chickeners encounter is neighborhood friendly predators. We had foxes, and Raccoons come by, and we are surrounded by homes! They are a rough and tough bunch of Austen era ladies, though. Maybe more of a Mother Jones. Just look at those disapproving glares. Love you too, Watermelon and Bully! Gorgeous!! 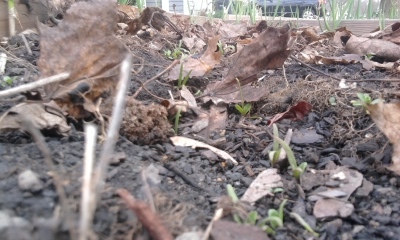 All of the front yard boxes have their uh... spiky things coming up. In front of us, we have Garlic which was planted last fall. 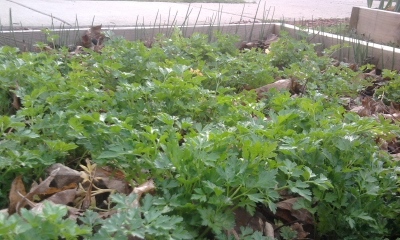 The flat Italian parsley overwintered pretty darn well. You would never have known winter came! 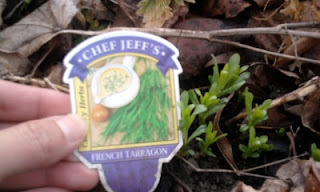 The English chives are coming up around it as well, and it'll be soon enough before we have purple flowers everywhere that look like the "Horton hears a who" flower. Possibly kill all my seedlings with an errant frost?! 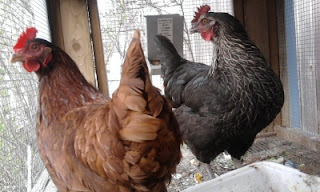 Hello to my Chicago neighbor from Tinley Park!I really enjoyed your blog especially the lovely ladies, your chickens. I have started my tomatoes from seeds in Feb by my bathroom window. I also wanted to plant alpine strawberries and had no seeds to buy so i found my frozen drie strawberry from last summer and used it . It actually germinated to my amazement. So I enjoyed seeing picks of your spinach since I've never had those before. I am really looking forward to expanding my gardening experience starting first with sharing the 25 organic tomatoe plants with friends. Giving some away really bonds people and we enjoy talking about the lettuce I gave away which grew all summer long.I think it's also very therapeutic!Keep up the good work! I agree, I love bonding with my neighbors, and the neighborhood.